The Spring quarter for toddlers is entitled God’s Love. This quarter covers Jesus’ miracles, parables, death, resurrection, and ascension. They will learn how to associate Jesus’ death, resurrection, and ascension with repetition of the numbers “1-2-3.” Toddlers will also learn to sight read words, like the word come in the lesson in which Jesus welcomes the little children to come to him. Many new vocabulary words are added to their repertoire, such as donkey, king, palm branches, cross, hosanna, and many more. Although toddlers are limited in their vocabulary and understanding, they are able to learn some Bible stories and grasp some basic Bible truths. These little ones will gain a firm, biblical foundation upon which future teachers will build. Most importantly, in every lesson they are pointed to Jesus and their need for him. 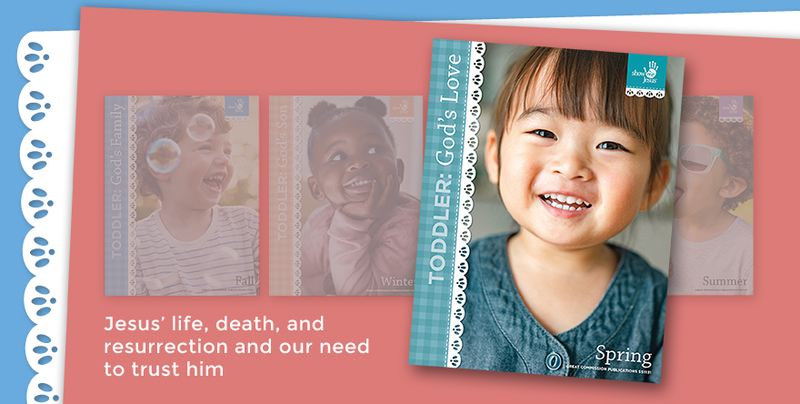 The Spring quarter for toddlers is entitled God’s Love. This quarter covers Jesus’ miracles, parables, death, resurrection, and ascension.